As I mentioned some weeks ago, I remain a fan of the ahead of its time, little seen, and under-appreciated masked crime fighter TV series from the 1966-7 season, The Green Hornet. More so, the other thing that marked the program distinctly was its theme song. The tune used reflected back to a time when such things were important in ways now long forgotten in today’s programming. Decades ago, it was a practice of sort to aspire a show’s signature tune to be liked enough that it’d make its way up the pop music charts. The Hornet’s would do just that and influence those that came afterward. Back then, it wasn’t unheard of for television shows to employ classical music tracks as their theme songs. The Lone Ranger famously used the William Tell Overture as its musical prologue. And the long-time radio program for The Green Hornet, the one that preceded its ’60s namesake TV series, used the orchestral interlude for Nikolai Rimsky-Korsakov‘s opera The Tale of Tsar Saltan, Flight of the Bumblebee, which was composed in 1899–1900, for its introduction. Editor’s Note: Brian Moon in the comments makes the case that while Rimsky-Korsakov’s Flight Bumble Bee was probably the inspiration for the Green Hornet Theme, it is a different tune written by Billy May, “…which has been recorded by trumpeters such as Rafaél Mendéz and Wynton Marsalis, among others.” The post has since been updated to reflect this information. However, for the television show version it was significantly rearranged for the television series by Billy May. That noted musician-arranger-conductor gave it a decided kick by incorporating a big band jazz style makeover that was nicknamed “Green Bee”. And with that, The Green Hornet theme1 became best known for the trumpet solo played by the New Orléans-bred music legend, Al Hirt. If skill with jazz and that particular instrument were ever needed to deliver on a musical piece, one that really demanded it, only someone in stature of this trumpeter and band-leader could carry through with the challenge. And he surely did that. While Lionel Newman conducted the orchestra in support of the piece, Al Hirt’s solo was so exemplary it popped out to dominate once the song’s opening notes passed. Literally, Al’s virtuoso trumpet quickly pushed everything to the background. 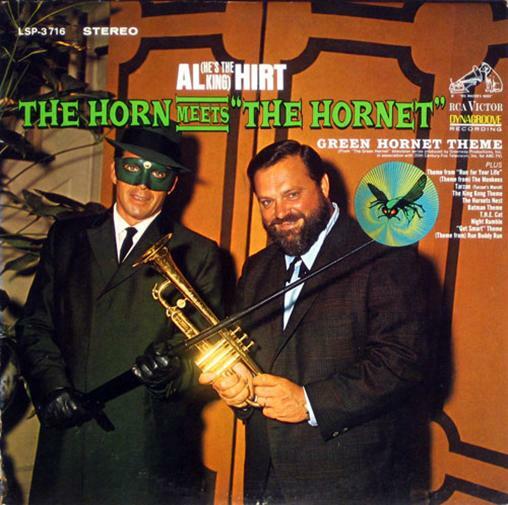 While his Java recording from 1964 endures as the trumpeter’s biggest chart hit, it’s safe to say Al Hirt’s version of Flight of the Bumblebee Green Hornet remains just about iconic for the eyes and ears of those old enough to remember the program and its signature theme. So much so, director Quentin Tarantino, in a clear homage to Bruce Lee and The Green Hornet TV program, introduced it to younger generations when he re-tasked the song for a transitional sequence in Kill Bill Vol. 1. Needless to say, it’s far from forgotten now. Good one. “Flight of the Bumblebee” was an outstanding choice for a theme song for this show. The song’s frenetic pace matched the onscreen action. And I had forgotten that Tarantino had used the piece in KB: V1. But he was always good at picking great music for his movies. Second only to Scorsese, in my opinion. Oh, yes. Both Scorsese and Tarantino are fantastic at picking just the right music for their films. Thanks, John. You covered all the bases quite nicely! I enjoyed the short lived ‘The Green Hornet’ television series back in the 1960s. Decent lead character. Great sidekick in Bruce Lee”s Kato. Wicked cool Lincoln as the Black Beauty all came together in a show that tried to go to action, characters and plot instead of camp. And was then kind of punished for it. Superb music too. Al Hirt’s ‘Flight of the Bumblebee’ rocked out loud and fit the series perfectly. It’s nice to see that his work made an impression with pop culture infused Tarantino. Great comment, as usual, Kevin. Many thanks, my friend. Hiya! Just dropping by to say hello. Haven’t been online a lot lately but I’m keeping up, quietly though. 🙂 And, as always, I enjoy your thoughtful posts! I’m not that familiar w/ The Green Hornet comics or TV show, but that’s a cool theme song! Isn’t it? Many thanks, Ruth. I never actually saw The Green Hornet, but man, I love this song! Tarantino really made great use of it in Kill Bill. It really was a fun, short-lived series. QT’s insertion of this song into KBV1 was just perfect. Thanks, Eric. The Green Hornet Theme was written by famed trumpeter, arranger, and big band leader Billy May. It is not The Flight of the Bumble Bee by Rimsky-Korsakov. Bumble Bee is probably the inspiration for the Green Hornet Theme but it is a different tune which had been recorded by trumpeters such as Rafaél Mendéz and Wynton Marsalis, among others. Welcome, Brian. You make a good, valid point about this piece. Thank you for reading and adding to this with a keen comment. Much appreciated. My pleasure to spread the word. I’ve corrected and updated the post, Brian. Thanks again.